As you may have read on my blog at one point, I get my dad’s mail and one of the things that comes in his mail is AARP stuff. I glance through it because sometimes I think it is informative. Sometimes it can help people of all ages. I took a copy/picture of this information because I thought it could be helpful to anyone that is a caregiver to someone in California. The first one mentioned I am not even sure I understand because I can’t imagine a patient being discharged without the caregiver being giving instructions and training on how and what to do in order to continue the care. It could be that I am primarily familiar with Kaiser and I am pretty sure that in the cases that I am familiar with there had been instructions and training. But I guess that is not always the case. 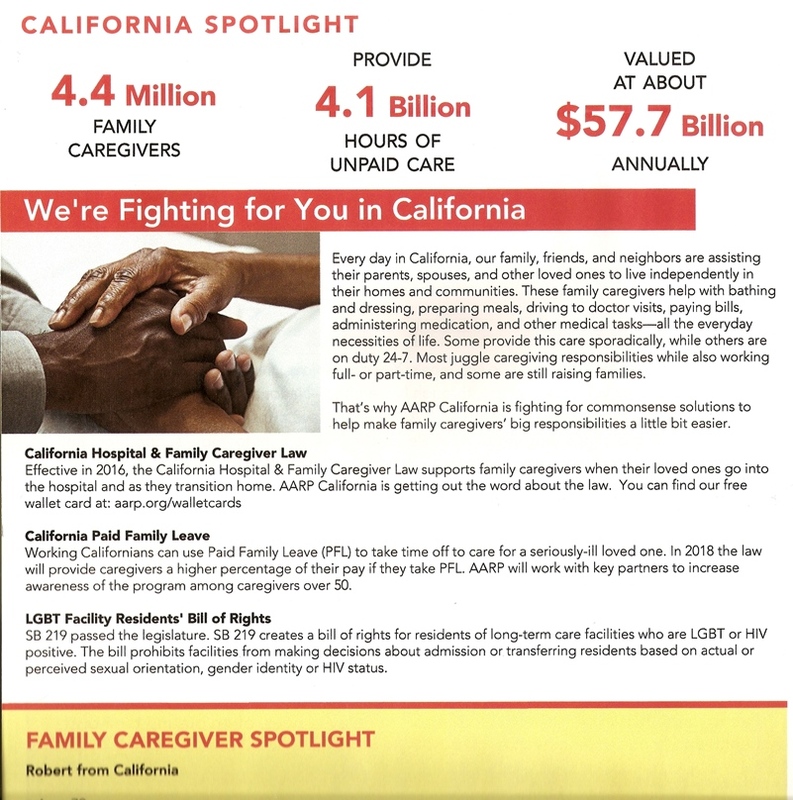 So it appears to me that the first law mentioned on this flyer AARP is calling the California Hospital & Family Caregiver Law makes it a law that written instructions and training must be given when a patient is released and needs further medical care. This was signed and filed in 2015, and AARP is saying it was effective in 2016. AARP is just highlighting it so caregivers know that there is a law that requires hospitals to give caregivers what they need to continue care. The California Paid Family Leave (PFL) “California Paid Family Leave (PFL) provides up to 6 weeks of partial pay to employees who take time off from work to care for a seriously ill family member (child, parent, parent-in-law, grandparent, grandchild, sibling, spouse, or registered domestic partner) or to bond with a new child entering the family through birth, adoption, or foster care placement. I just copied that directly from the State of California Employment Development Department site so that I didn’t inaccurately state something. So the change is the increase in the percentage of pay. Another bill passed was the Lesbian, Gay, Bisexual, and Transgender Long-Term Care Facility Residents’ Bill of Rights. Which makes it unlawful for any long-term facility to transfer a person based wholly or in part on their actual or perceived sexual orientation (amoung other things). This is one that is best read on the site because it is long and I don’t want to leave anything out or state it incorrectly. It was approved and filed in October of 2017. See? This information might have to do with elderly people, but it really is for the caregivers of these people. It could be that the young people – the ones providing care and the ones NOT subscribed to AARP – never get this information because they are not reading the AARP magazine. So . . . I thought I would share it. If you do need any of this information please look it up on the actual websites as you can see this information is not complete. It is just a quick summary to help you be aware of information you might need.